Some of the major companies comprised in the global marine engine market are Sumitomo Heavy Industries, Mercury Marine, Roll Royce limited, Cummins Inc, GM Power Train, Hyundai Heavy Industries, Mitsubishi Heavy Industries, Caterpillar Corporate, Wartsila Corporation, and MAN Diesel & Turbo SE. These players have a lion’s share in the growth of the global marine engine market. 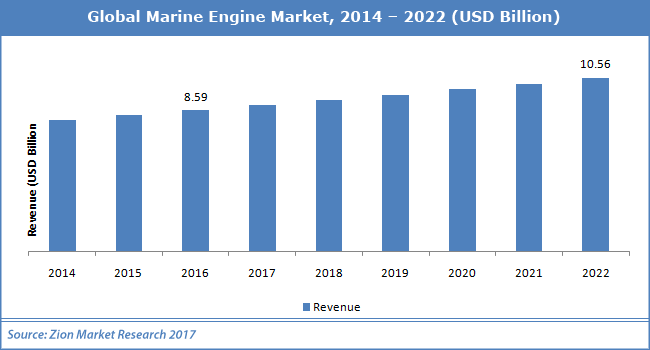 According to analysts at Zion Market Research, global marine engine market was capitalized at USD 8.59 Billion in 2016 and is likely to cross USD 10.56 Billion in 2022, developing at a CAGR of 3.5% from 2017 to 2022. Major boosting factors for the development of marine engine market are advanced development of inland waterways vessels, emergence of new technologies, and high requirement for commercial vessels, as per analysts at Zion Market Research. The tech of marine engine has been impaired to a status where it can have a primary effect on present life. Huge capital constraints and huge demands of R&D activities can be limiting factors for the development of marine engine market. The global marine engine market provides new growth avenues due to rising requirement for hybrid fuel engines. Rise in the requirement for the low-priced engine will also elevate the growth of marine engine market. In addition to this, new launches by market players are also set to propel the development of the global marine engine market. For example, in January 2012, Cummins Inc. claimed that it is going to launch the new QSK95 engine with 2983 KW (4000 Hp) output as the most high-speed powerful diesel engine made for auxiliary generator sets and marine propulsion. This is set to tower the development of marine engine market. Marine engine market is divided based on applications and fuels. Based on fuel, the global marine engine market is categorized into marine diesel, intermediate fuel, marine gas oil, and heavy fuel. Heavy fuel market section has the biggest share of the marine engine market owing to huge requirement all over the world. Increasing requirement for a fiscally viable engine paired with an increment in seaborne trade will boost the development of the marine engine market. Asia Pacific was the largest and most attractive area for the marine engine market. An extra factor adding to the development of marine engine market will be an increment in maritime trade in South East Asia deployed by China and other emerging nations in the region including Indonesia. Owing to the high ship-developing activity in Asia Pacific area, it has become an active spot for marine engine market.